The Account tab lets you know how much you owe eBay and how much they’ll charge your credit card that month. This is a quick and easy way to check your most recent invoice, payments and credits, and your account; all these links are located in one area. You can also access your PayPal account to see, for example, when deposits were sent to your checking account. 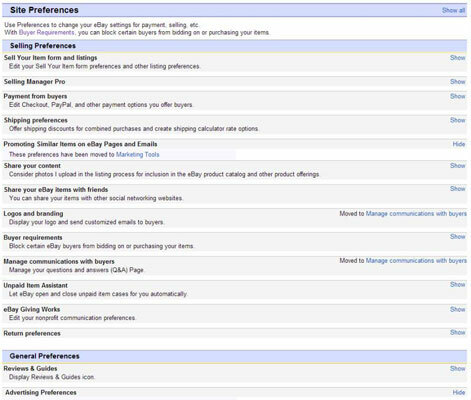 The Account tab is also a place where you can find a drop-down menu that links to the many areas that affect your selling procedures and account data. Click the Personal Information link to get to the Personal Information page. This is where you can change your e-mail address, user ID, password, and credit card information — and also edit or create your About Me page. You can also change or access any registration or credit card information that you have on file at eBay. There’s even a link you can use to change your home address on record. Keeping all your contact information up to date on eBay is important. If the eBay folks should ever find that any of the contact information is wrong, they may suspend your membership. Another link, Communication Preferences, takes you to where you can specify how you want to receive information from eBay and handle your member-to-member communications. By using the eBay mobile app, you can get instantaneous notifications on your smartphone. You may as well click through every option every once in a while. That way, you’ll be sure you have things set up just the way you want them for conducting business on eBay. Customer service is what it’s all about when you’re building and maintaining a business on eBay, so this space should be a regular stop for you. It’ll keep you apprised of how you’re doing with your customer service. 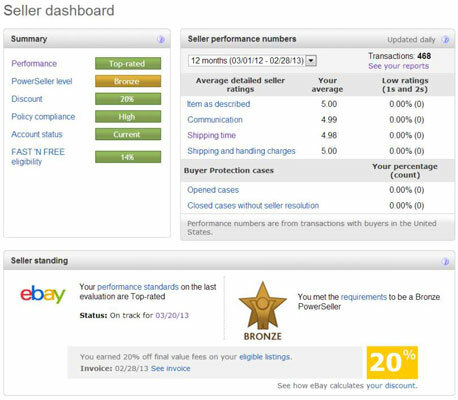 Your average DSR (Detailed Seller Ratings) will appear in a box at the top of the page. Each title on this page links to deeper information on your personal seller performance. There’s a lot of revealing data here, so be sure to click these links regularly to see where you can improve your customer relations (and status with eBay). If you’re a Top Rated Seller, the Seller Dashboard is a very important place — because this is where you can keep track of your Final Value fee discount (which is based on your ratings). Click the See Your Reports link near the top-right to generate reports on how your feedback has fared. In the Feedback area of the Account page, you can keep track of all your feedback duties. Feedback is a most important function of your eBay transactions; don’t forget to leave some for your trading partners! When you click the Feedback link, you can see your listings from the last 90 days. You see a star to the far right of a transaction if you’ve left feedback. (The star will be grayed out if you haven’t.) If your trading partner has left feedback for you, you see a sign in a comment-cloud icon — a plus sign means positive feedback and a minus sign means negative. At the very bottom of the page, eBay shows you recent feedback that has been left for you. But it’s much easier to click the feedback number next to your user ID to see your most recent feedback. Reply and Follow Up: Responding to feedback left for you is especially important, especially if the feedback is less than stellar. Every story has two sides. Make sure yours is prompt and professional. Request Feedback Revision: If you’ve solved a problem and turned an unhappy customer into a happy one, you can request that the person re-examine the feedback left earlier. 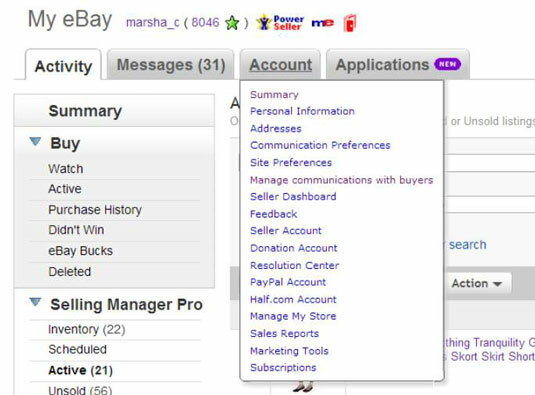 Should you want to check feedback for a specific eBay member, there’s a Find a Member search box where you can type in his or her user ID and go to the Find a Member page. Click the Subscriptions link, and you’ll be able to see just which additional selling tools you’re paying for. From here, you can upgrade, downgrade, or unsubscribe.